It seems that the majority of students here at Morton East may have tattoos. In a survey of 120 Morton students (mostly seniors and sophomores), 70 Morton students claim they got a tattoo before the age of 18; 50 Morton students claim to not have a tattoo. One research project says 30% of students who get tattooed at a young age choose to get a cover-up to hide what they regret getting. Just because their parents aren’t okay with it and or they don’t know what to get done, a lot of people make a somewhat random choice of what they want to get tattooed on their skin. So, what do students at Morton East think? 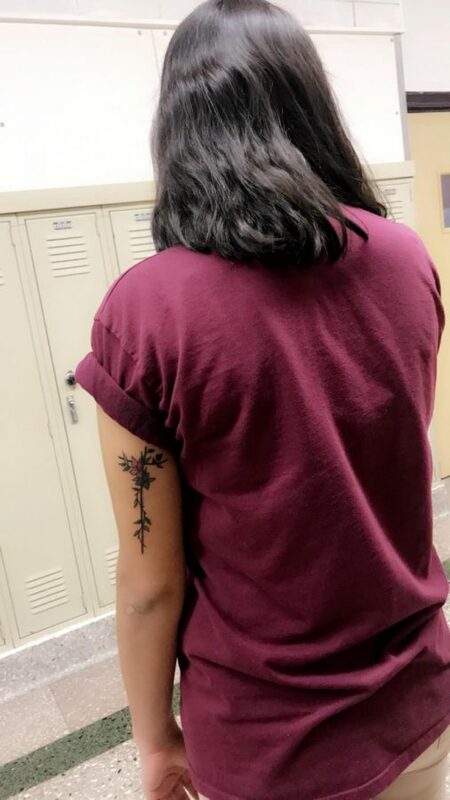 “I don’t regret my first tattoo because it means the world to me; my tattoo has a big meaning and I wouldn’t regret it; my parents didn’t get mad because they knew it was something meaningful,” senior Jenny Rodriguez said. “I personally want to wait till after high school and get my career then think about getting a tattoo, because I don’t want to have a hard time looking for a job always struggling. And I’ll be able to once I’m out my parents’ home because there very against it,” Sophomore Brandon Ortiz said. “I honestly can’t wait to get a tattoo because I see everyone get one, and I think it’s dope. I feel like my parents can’t tell me anything because I work for my own money, and I’m the one that’s going to be paying for it,” Junior student Maria Alvarez said. “I got tattooed after high school because my friend was cancer free, and we all agreed to get tattoos together. I wish I would’ve gotten something bigger, but I guess at the moment it was okay,” Morton dean Mr. Dugan said. I (Destiny Barrera) personally feel like I got a tattoo during high school not to show off but because it means something to me. It’s been my first tattoo, and I don’t regret getting it done. It’s your body. Nobody can tell you what you can and can’t do. As teens, it’s true that we are young and maybe not thinking right. If you get a tattoo, make sure it’s something that you won’t regret. I support everyone whether they want a tattoo at a young age or don’t want one at all. It’s your body and you do you. To be completely honest I think it’s super cool to see people around school with tattoos, tattoos are great to see. I would want to get one of my own, ideally small and simple. I don’t have any in mind at the moment that have a super deep meaning, I just think that a small picture of maybe a dinosaur or maybe a smiley face would be cute. I haven’t seen anyone around with one but i wonder if there’s anyone at school with a face tattoo. people with face tattoos that actually look good are legendary to be completely honest. I feel that now in days a lot of teens get a tattoo. I personally like tattoos but as right now i’m not planning on a getting a tattoo. I totally agree with Brandon Ortiz, trying to get a job while having tattoos can be hard. That one of the main reasons why i am not planning on getting a tattoo right know because i want to get a well pay job. Overall i love tattoos and i fell that you can empress your self by them. I also believe that your body is like a canvas and you can pick what you want to get on it, you can get something that is super meaningful or just get one for fun. I think it doesn’t matter if you get a tattoo because you think it’s cool or because it has a sentimental meaning, in the end your tattoo will be something special for you. I think that it is amazing how Morton students have the courage to be talking about something that is on their body and how meaningful it is to them. I personally would love to get tattoos, but my parents would be furious if I get one without their consent, but I will for sure get one when I am adult. I think that it is good for someone to get tattoos because they are expressing themselves but having art encrypted in their body and not only that, but that they feel comfortable having it permanently on their bodies that have a significant meaning. Parents should be able to give their child a chance to get something on their body because it is their body, so it is their choice. Whether it is piercings or tattoos, it is the individual that it going to live with it. Not the parents, but as looking at the parents perspective, they know that having tattoos is bad because it is permanently on your skin/ your body.